With Halloween nearly upon us I've been thinking about the one of my favourite literary monsters that has been a mainstay of pop culture for over a century. Dracula and his vampiric offspring have gone through numerous iterations on film from 'Nosferatu', the Hammer Films stalwart Christopher Lee (Saruman the White to you younger readers) through to the sparkly skinned, eternally moody teenagers of the Twighlight franchise. Most recently Dracula Untold puts a different spin on the tale weaving the classic vampire mythology with elements of historical fact (quite tenuous and selective facts though I should say). 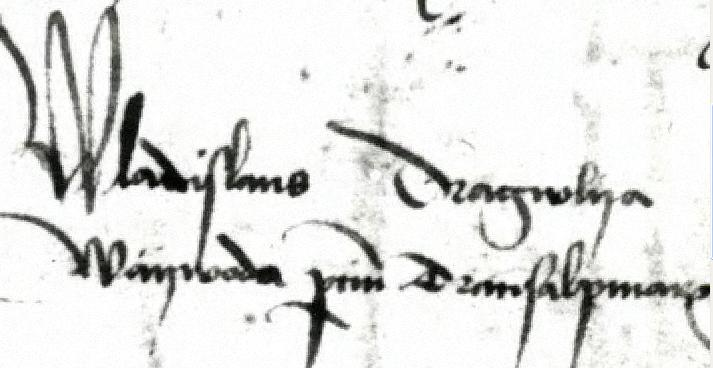 It transcribes as "Wladislaus Dragwlya, vaivoda partium Transalpinarum". Born in 1431 Vlad came into the world at a very precarious time. Wallachia was a border principality between the Ottoman Empire and the Christian kingdom of Hungary. Both struggled for control of the border principalities, intervening in local politics and striving to put their own puppets on the throne. In addition to external forces, the internal politics of Wallachia was a veritable snake pit with powerful noblemen or Boyars vying for control of the incumbent. Think "Game of Thrones" but with less humanity. Vlad's father was inducted into the Order of the Dragon as a calculated part of these machinations. Vlad would spend his formative years in captivity in the Ottoman court; held with his younger brother as a ransom against his father's compliance with the Sultan. Vlad was an adept if unruly student mastering the arts of war as well as Turkish and the Quran. Vlad's brother, Radu (with the epithet "the Handsome") would make himself at home at the Ottoman court ingratiating himself with the Sultan and powerful Ottoman nobles. Vlad on the other hand was rebellious and constantly at odds with his captors. Several writers attribute his future atrocities to the enmity he felt towards the Ottomans from this time. Vlad would rule over Wallachia three times in his life. The first time it would be for a mere two months; sponsored by the Ottomans following the usurpation and death of his father Vlad captured the throne whilst the incumbent was away fighting against the Ottomans in the Balkans. His second period on the throne would the longest and also the period when he secured his bloodthirsty reputation. Constantinople fell to the Ottomans in 1453 enabling them to invade Europe proper. Vlad came to the throne in 1456 and immediately adopted an anti-Ottoman stance. Documents contemporary to Vlad describe a number stories of his brutality. In one he invited the most troublesome of his Boyars to a feast only to have them all stabbed and impaled on stakes to discourage dissent. Perhaps the most famous incident followed an Ottoman invasion of Wallachia. Vlad fought a guerilla war against the invading Turks, raiding their camps and taking prisoners all the while retreating and leaving behind nothing but scorched earth behind him. Finally, after a punishing march to reach Vlad's capital, the Ottomans found the city deserted. Along the road and in the surrounding fields however all of the Ottoman prisoners had been impaled on wooden stakes. Their morale destroyed and with no enemy to fight the Ottomans finally withdrew from Wallachia. After this victory Vlad was forced into exile once more by rebellious subjects but would return for one last period on the throne in 1476. Within a year however he and his bodyguard were ambushed by Ottoman forces and killed. One tale of his death says that the Ottoman Sultan was so terrified that Vlad might have survived to terrorise his army again he demanded to see Vlad's head. The severed head was preserved in honey and brought to the Sublime Porte only for the Sultan to be too frightened to look upon his nemesis' countenance. As is often the case with those perceived as villains by outsiders, Vlad is considered a national hero in Romania today. There is something Arthurian in his representation as a hero of the people; He is acknowledged as a harsh ruler but always fair. Well, he probably distributed the impalings evenly at least. If you want some more halloween themed history why not come alone to the New History Lab this Friday at 4.30 pm? Not only will there be stimulating discussion but cake as well! Hopefully we'll see you there!